Coastal wetlands intercept significant amounts of nitrogen (N) from watersheds dominated by agricultural and residential development. We rely on these wetlands to remove excess nitrogen in efforts to reduce N-loading to aquatic ecosystems. Understanding what environmental factors most influence N-removal rates in coastal wetlands is critical for effectively managing these ecosystems. Here we investigate in silico how inorganic nitrogen transformation via plant uptake and microbial denitrification are affected by hydroperiod, plant community, season and N-loading rates using MONDRIAN, an individual-based community-ecosystem model. We predict rates of N-removal, by denitrification and sequestration in biomass and sediment, to be highest during periods of fluctuating hydroperiod throughout peak growing season. We also predict that long residence time of water will dominate the controls on N removal via denitrification. Our results will provide practitioners and managers with timely guidance to optimize N-removal in wetlands. Sean is a postdoctoral fellow at University of Michigan. 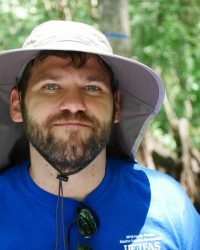 He uses simulation models to study the ecology of wetland plant communities along the Great Lakes coastline. He is currently working with collaborators from Michigan State University and Michigan Technical Research Institute to develop a landscape model of nutrient delivery to the coasts of the Great Lakes and invasion risk of wetlands in those areas.